A beautiful outdoor space can be a tremendous asset for a restaurant, and that shouldn’t change because of high winds or fluctuating temperatures. With Fenetex Clear Vinyl Weather Screens, your customers are protected so that their dining experience remains as comfortable as you intended it. You’ve worked hard to cultivate an atmosphere and ambiance, now protect it with this all-weather solution of clear weather curtains. 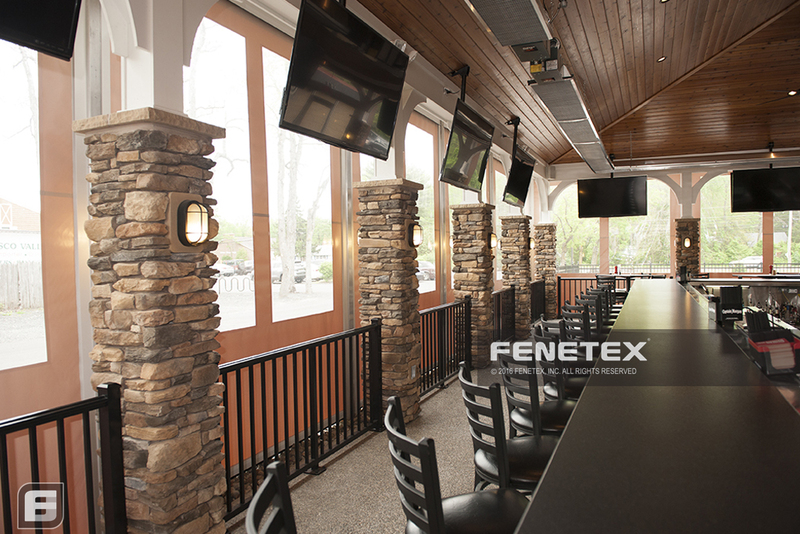 If you’re surrounded by beautiful scenery, your customers should be able to enjoy it all. 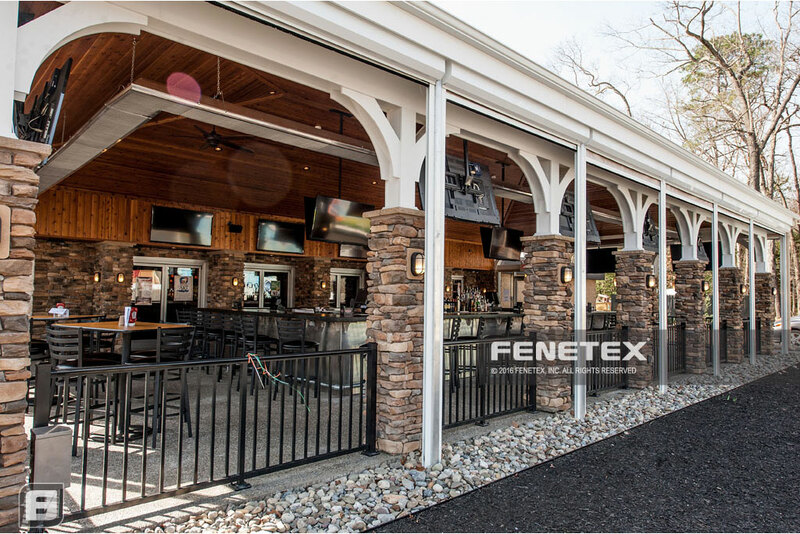 Only Fenetex uses full-width windows that let your customers drink in all of the surrounding scenery. 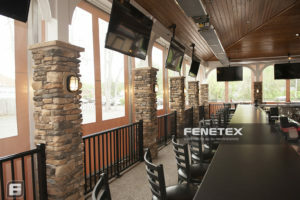 Installing our full-width windows means that there’s no such thing as an obstructed view. Our clear vinyl weather curtains are built with the same engineering and craftsmanship in mind as our heavy duty hurricane screens. They’re made from 30mil marine vinyl which allows them to withstand winds up to 75mph without blowing out. 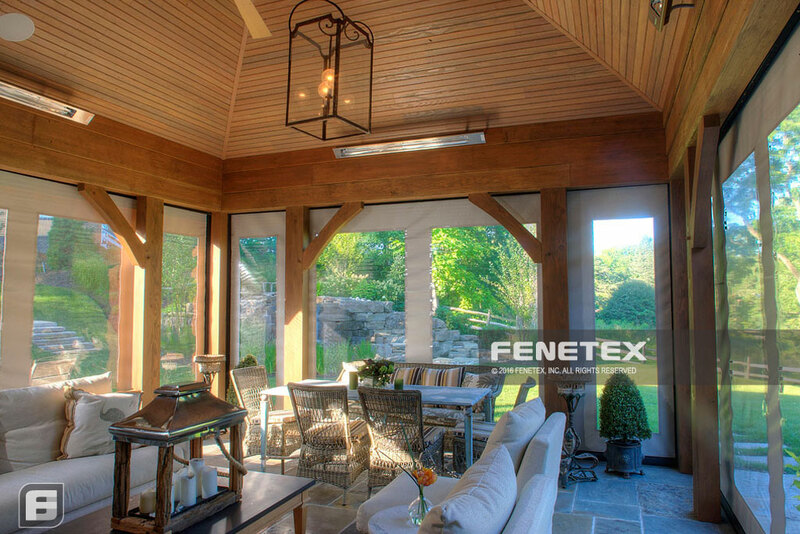 Our clear vinyl weather curtains can be motorized to deploy at the touch of a button. They can be paired with smart home automation systems that can be operated and monitored from anywhere in the world or even deploy on their own when disaster strikes. No matter where you are, you’ll have peace of mind knowing you’ve installed our clear weather curtains. 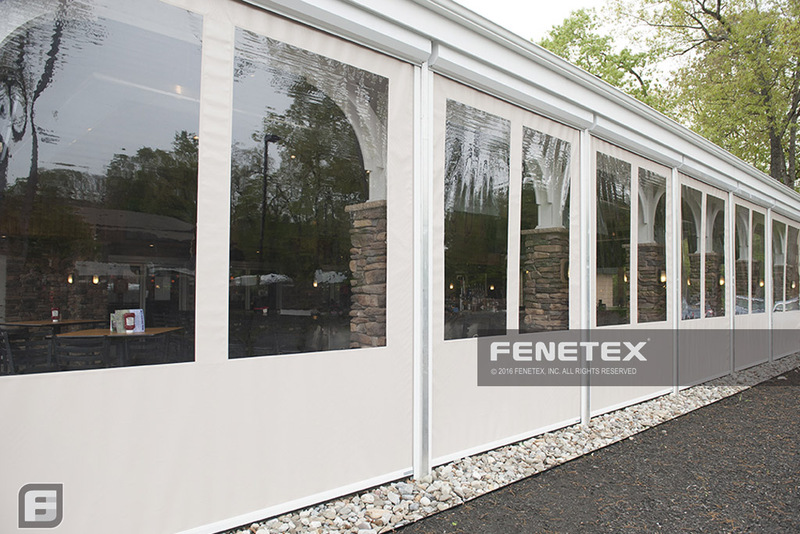 Designed to last a lifetime, Fenetex Retractable Clear Vinyl Weather curtains utilize our two-part adjustable track system. Adjustability is especially important in cold weather because the vinyl expands and constricts as temperatures drop. Our patent pending aluminum tracks can be adjusted with nothing more than a Phillips head screwdriver ensuring they fit perfectly at installation. Fenetex Retractable Clear Vinyl Weather Curtains can be paired with Fentex hurricane screens or any other Fenetex retractable product into a single system. Each screen operates independently giving you the protection you need when you need it. 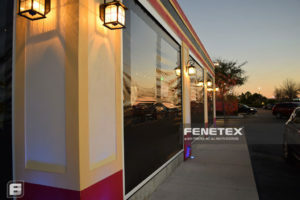 Clear vinyl screens are intended for applications where their use is primarily to close off a patio area so that it can be heated, cooled, and/or protected from inclement weather and environmental nuisances like pollen. While daily up and down cycles are common, it should be noted that the environment where clear vinyl screens are installed may affect their performance. 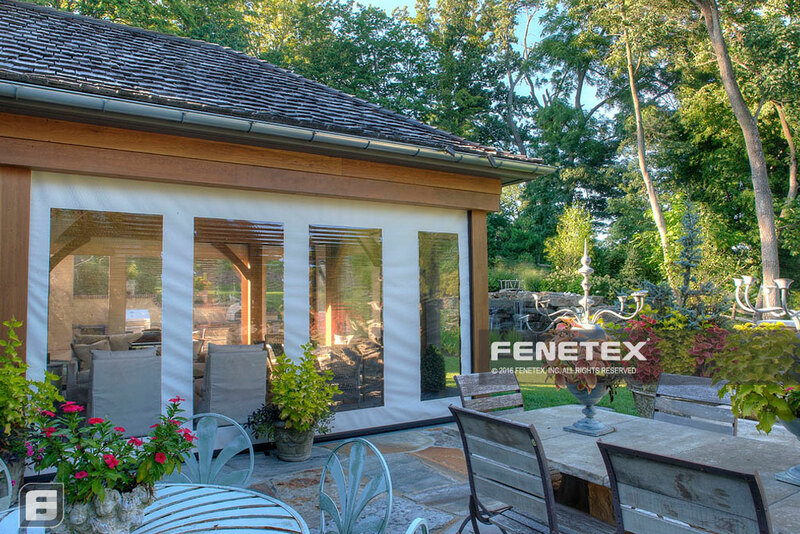 Fenetex has taken great care to design a system that works reliably but the nature of the clear vinyl material is that it is subject to shrinking in cold weather and sticking in hot weather. This means that on very cold days the screens may need help to unroll because the clear vinyl will harden and shrink and on very hot days the screen may need help to unroll because the clear vinyl will soften and stick to itself; both of these conditions can also cause the screens to come out of the track while lowering the screens. It is important to observe the screens while operating them. Should the screen come out of the track, stop screen movement immediately, raise the screen to the point where the screen goes back into the track and continue normal operation. Operational issues or required service stemming from incorrect operation are not covered under any warranty. All clear vinyl will eventually discolor, this will occur faster if the vinyl is not properly maintained. Discoloration is not covered under any warranty when the vinyl is not regularly maintained. In addition to the above there are fabrication considerations for clear vinyl. 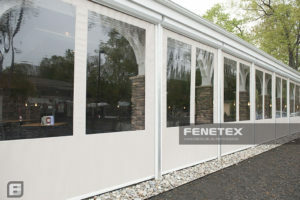 While Fenetex produces a standard configuration, this product often requires customization. These options will need to be detailed on the worksheet “Clear Vinyl Screen Diagram” which is available in the Technical Library of the Fenetex website.